This region embraces an impressive range of habitats from the Pyrenees to the sun-drenched Catalan coast. As a consequence the area is rich in birdlife and full of potential for visiting birders. Almost 200 sites are described in this fully updated third edition, with full coverage of terms of habitat, access and the species to be seen. The accounts are illustrated by detailed maps and beautiful line drawings of selected species. 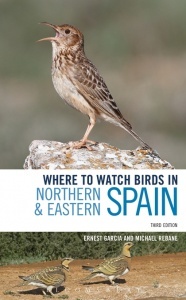 Where to Watch Birds in Northern and Eastern Spain includes comprehensive coverage of all thirteen autonomous regions, a descriptive list of all the resident, visiting and rare birds to be found, as well as advice on watching seabirds from key sites like Estaca de Bares. This edition provides better coverage than ever to one of the most popular birding destinations in Europe. Paperback. 384 pages. 125 maps detailing all the key sites plus 30 line drawings of local bird species.